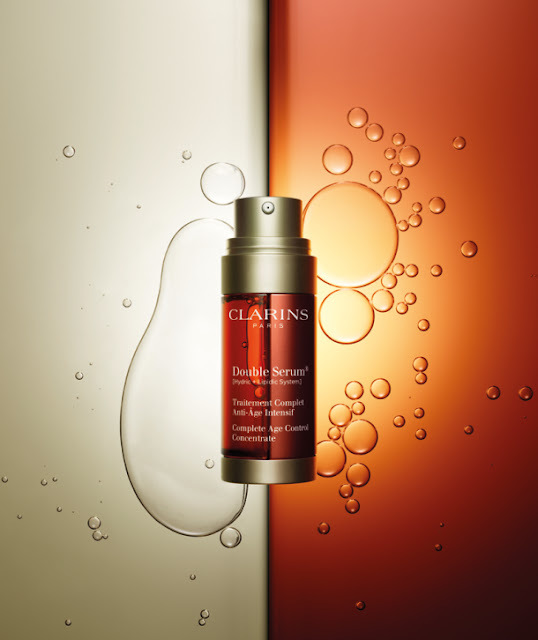 So on the 1st January I blogged about this new product from Clarins coming to the UK soon. I believe it is out in February or March in the UK but it is already available in the Far East, Middle East and US. I said I would try it for 1 month and then review it so as today is the 1st February here is my promised review! I have used this religiously for the past 31 days-2 squirts in the morning after cleansing and 2 squirts in the evening after cleansing. This serum is recommended for all skins from age 25. I am 32 so definitely fit the demographic Clarins are aiming at. The best of science and nature in one product, Clarins say this is the culmination of 27 years of anti ageing expertise. This new formula, the result of the very latest advances by Clarins Research, combines the 20 most powerful anti-aging plant extracts to deliver a proven, targeted action on the 5 functions on which skin’s youthful appearance depends. Visible results, optimized by an ultra-precise delivery system and proven by an unprecedented series of tests: noticeably fewer wrinkles, skin that is firmer, more even, more resilient, with renewed radiance and less visible pores. The nozzle is designed so that it dispenses the perfect amount of serum. So that's the science-what about the actual results? The serum is extremely light-it's recommended that you warm the serum in your hands before applying to the face which I did, and it absorbs into the skin quickly meaning you can apply your other skin care almost immediately. I'd been using Estee Lauder Illusionist in the morning and Kiehls Midnight Recovery in the evening so I replaced both these serums with the Clarins for the past month. In terms of 'heaviness' this serum was most similar to the Kiehls serum-extremely light and watery and not oily. The serum is not sticky whatsoever so it feels comfortable on the skin. Your skin doesn't feel tight, irritated or tacky after using it. Well here's the thing. I just think this serum is ok. I don't love it. I don't see visible results-I don't see smaller pores or firmer skin, or feel more radiant. I've also had a few breakouts in January-but just on my chin. Now to be honest I have been chopping and changing my skincare routine all month-the only consistent product I have used is this serum and my foundation. So I can't definitely say this causes breakouts but my skin is certainly not the best it has ever been. It's also important to consider that this product will retail at around £60 when it launches in the UK. After 31 days I have probably 10 squirts, if that left in the tube. So that's £60 for approximately a months supply. I would seriously have to love this serum and it make me look like a supermodel to commit to spending that every month. And it doesn't. I wouldn't buy this again to be honest. But don't just take my word for it, just because it doesn't work for me doesn't mean it wouldn't work for you. In the interests of balance I have had a look on the internet for other beauty bloggers reviewing this serum and here are some great reviews of the product here, here, here and here.